We updated our reviews of oceanic dive computers in 2019. The early days of scuba instrumentation requires the use of several instruments in order to determine a specific parameter. For example, you need a dive watch to determine your bottom time, depth gauge to determine your current depth and submersible pressure gauge to determine the amount of air remaining in your tank. However, having multiple individual instruments could be bulky and could take up space. This is the reason why dive computers were invented. Dive computers were introduced way back in the 1980’s and Oceanic played a significant part in its development, especially when Bob Hollis (the founder of Oceanic) promoted it in the entire diving industry. Since then, diving was revolutionized with the use of dive computers which can track, calculate and display important information like dive time, maximum and current depth, ascent rate, air consumption, nitrogen absorption and surface interval to name a few. In fact, due to its effectiveness and compact form, dive computers have recently been considered a mandatory piece of diving equipment where you can direct your underwater adventures in a safe profile. 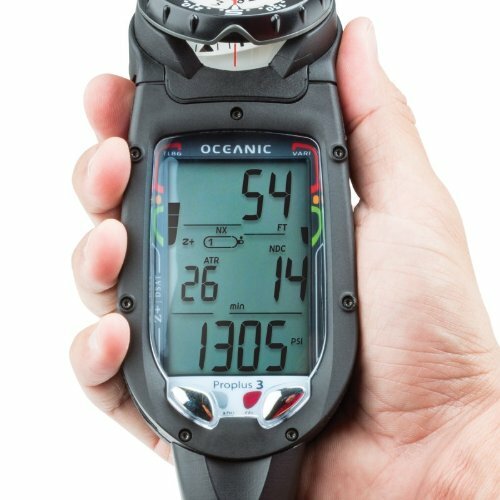 While there are several brands and models available in the market, Oceanic has its own line of dive computers where every diver around the world find it easy to use. And not just the basic features we traditionally know, Oceanic computers are integrated with the state of the art innovation such as Bluetooth and dual algorithm platforms making sure you can access your profile at the most accurate figure. With regards to classification, there are three types of Oceanic Dive Computers: the wrist type which is worn just like a watch, the console type which needs to be attach to the high pressure hose assembly and the clip it type which acts as a backup dive computer.. The Oceanic Veo 2.0 is one of the most popular diving computer that allows you to choose the decompression algorithm that suits your diving profile. Powered by Oceanic’s exclusive dual algorithm, you can select from three different modes, namely: NORM which is selected is you use air or nitrox, GAUGE which is used with run timer and FREE which tracks calculations if you switch between Norm to Free mode and vice versa. This wrist type dive computer has two operating buttons that allows you to do "Step Forward" or "Fast Scroll" interface. The buttons are very important in streamlining your access and configuring it to your personal preference such as nitrox mix of up to 50%. The Oceanic Veo 2.0 has an audible alarm and a flashing LED light that sets on in case you exceed the safety dive profile. 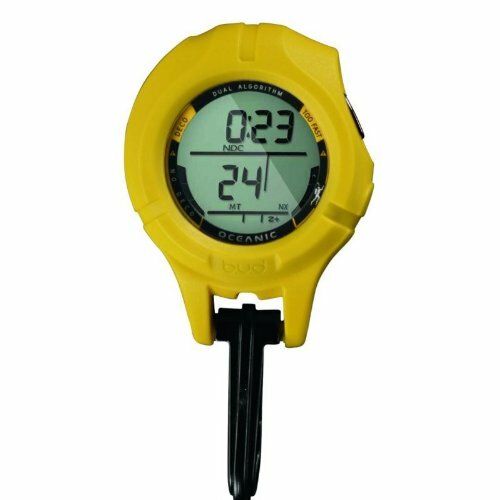 It has a user acknowledgement Deep Stop function with countdown timer making sure you stay within the limits of the entire dive. This safety, however, can be turned on or off, but just in case you turned it on and you are about to reach the maximum limits, a 2 minute countdown timer will commence starting at the half mark of your maximum depth. While the backlight can be manually turned on, it automatically switches on during low light conditions making sure you see the figures in the screen. Presented in an upgraded look with a stainless steel ring and several color combination, the Oceanic Geo 2.0 Air/Nitrox Computer Watch is one of the popular dive computers in the market. From its previous version, it now has a dual algorithm, a deep stop option, a programmable no-deco and deco dive profile and a reinvented user interface with a “Step Back” function that allows full navigation on its menus and settings. While this dive computer is designed for use in both air and nitrox, it further has a second Nitrox mix that can be program up to 100% nitrox mix. Perhaps, of all the functions that stands out with this dive computer is that you can program the unit and set your own preferred maximum depth and an alarm will automatically beep once you reach that desired depth. 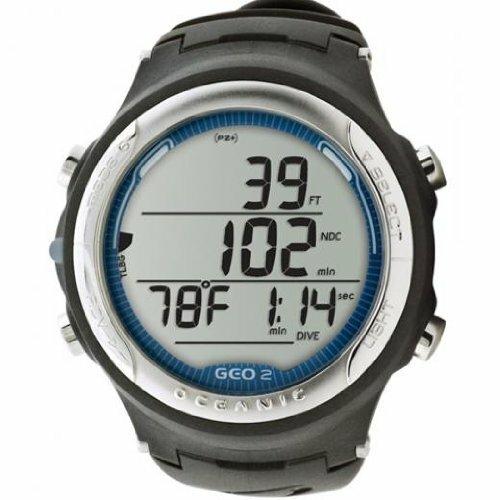 As far as software is concerned, the firmware of the Oceanic Geo 2.0 Air/Nitrox Computer Watch has an auto update function that allows you to download and install software improvements and other features that will be introduced in the near future. This upgraded software feature is made possible courtesy from its PC interface that can be linked through an optional cable. Designed to deliver quick and highly visible dive information, the Oceanic Pro Plus 3.0 Dive computer has of the largest monitor display in the market. All of the information are displayed in supersized digits making it easy to read. On top of the highly readable figures in the display, many of its users have appreciated the intuitive user interface that has an enhanced support features. A perfect example of this is how the dive computer monitors your actual and accumulated dive profile making current and repetitive dives very safe. When you start descending, this dive computer will automatically turn on once it gets wet or you can do it manually. It will initially display the current depth, cylinder pressure and the time you are allowed to stay at the current depth. Further it calculates and displays, through a loading bar, your oxygen load, nitrogen build up and deep stop. 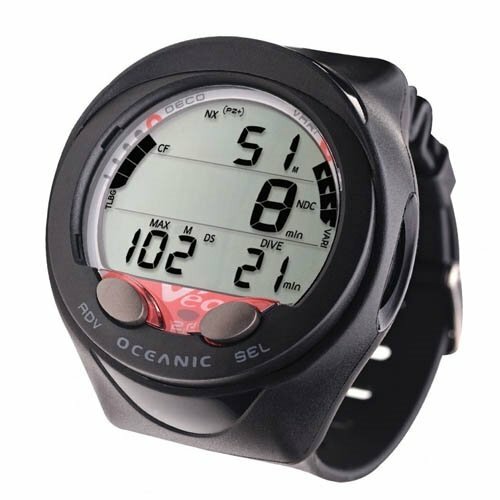 The Oceanic Pro Plus 3.0 Dive computer is fully programmable where you can set your maximum depth, deep stop, safety stop and a lot more. You can further calibrate it according to the type of dive site, like freshwater or saltwater. It has data retention capabilities where this computer can store up to 24 dive logs even if the battery is low and needs replacement. There are 2 models that you can choose from this particular dive computer: the unit with a compass or the unit a quick download and USB compatibility. The Oceanic Pro Plus X Dive Computer is classified as a complete dive instrumentation device. Aside from the usual information a dive computer displays like maximum and current depth, bottom time, temperature, tank pressure and surface interval time among others, it has a built in digital compass making this an all in one dive instrument. One of things taught to us during our classroom lecture for a scuba certification course is equipment redundancy. This is the reason why the Oceanic B.U.D. Back Up Dive Computer is made. It is not a wrist type nor a console type of dive computer, but it is Clip it and Cling on type where it is designed to be easily hooked in your BCD. It is brightly colored yellow allowing you to easily spot and locate this dive computer even if the visibility is not that good. When it comes to computer function, it has the dual algorithm interface like most Oceanic dive computers have. Menus and setting can be set and adjusted to fit your dive profile and preference. It can even be programmed for Nitrox compatibility of up to 50%. While its battery are long lasting, you can easily replace it when the time comes that it is power drained. The Oceanic B.U.D. Back Up Dive Computer has earned the title as one of the most popular back-up dive computers where you can rely on it especially during instances that you or your buddy’s dive computer has failed. We recently updated our review of the Shearwater Teric wrist dive computer - take a look here to learn more about best wrist dive watches on the market.